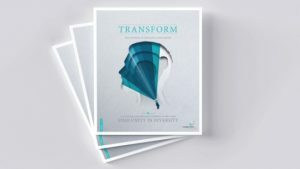 Transform Issue 3: December 2018 | Can the Critically Engaged University of the Future Find Unity in Diversity? Home > Transform Journal > Transform Issue 3: December 2018 | Can the Critically Engaged University of the Future Find Unity in Diversity? 06 Dec Transform Issue 3: December 2018 | Can the Critically Engaged University of the Future Find Unity in Diversity? WELCOME – Can the Critically Engaged University of the Future Find Unity in Diversity? This edition is challenged by Professor Glyn Davis’ notable valediction in response to receiving the AFR Higher Education Lifetime Achievement Award to get to the next emerging stage of engagement for Australian universities. The emerging theme is that ‘engagement’ is a very diverse concept (research, teaching, learning and social analysis are all involved); it is more a framework or a ‘field’ of action and analysis than a single conceptual entity. Nevertheless it must have form and shape, and its own intellectual definition and integrity, which can bind the diverse and varied content within a focused perspective. Whereas some single institutions have managed this, often as a function and consequence of outstanding leadership (pace Davis and Melbourne) we now face the need to scale up and broadcast what has been learned and to define what needs to be done. This is important if change is to be brought about in a coherent way potentially for the sector as a whole. A number of key themes have emerged from Davis’ reflections over his career as Vice Chancellor that highlight the importance of finding ‘unity in diversity’ and these issues are some of those that face us as we seek to mould the critically engaged university of the future. Article 2 – Community Engagement in Critically Engaged Catholic Universities: Models from Australia and the U.S.